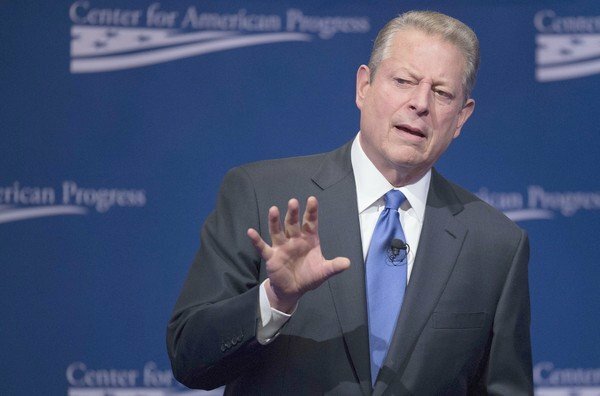 Al Gore has finally gone vegan. People were beginning to wonder, since he had been ordering only vegan food at events. He had also spoken about reducing his meat consumption in light of livestock’s impact on global warming several years ago, giving us a glimmer of hope. At that time he admitted, “It’s absolutely correct that the growing meat-intensity of diets around the world is one of the issues connected to this global crisis, not only because of the CO2 involved but also because of the water consumed in the process.” Then more recently the plot thickened when we heard that he was a potential investor in a vegan egg substitute company, Hampton Creek Foods. Finally, mention of his having gone vegan was slipped into an article in Forbes magazine. We’re jumping for joy on this one. Almost exactly four years ago, we sent him a copy of our book, The Vegetarian Solution, and included a personal letter with it, encouraging him to make the change. We received a short note in return but have heard nothing since. Although we certainly can’t take any credit for anything, imagine our delight when we found out that he had actually made the switch. We couldn’t ask for a more wonderful holiday gift!